"I feel blessed to be here with you. I wish it were for a different reason" said Democratic presidential candidate Hillary Clinton as she spoke in Flint Sunday afternoon. 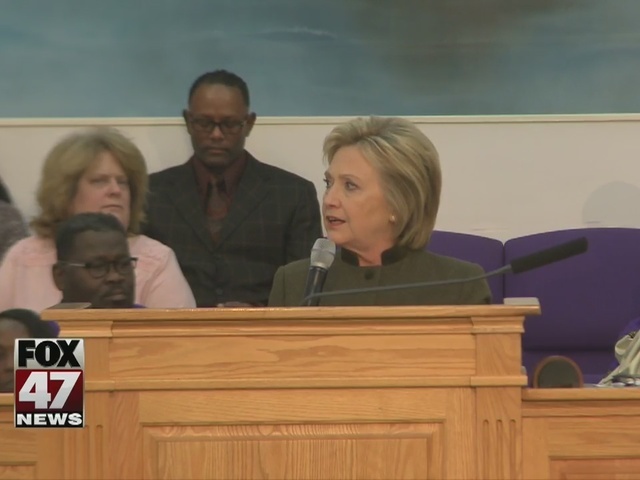 Clinton attended the service of Prayer House Missionary in Flint. She first brought the city national attention after using her closing statement in a debate to address the issue. "This has to be a national priority not just for today or tomorrow. Clean water is not optional, my friends, it is not a luxury," said Clinton. While at the church, Clinton used her platform to meet with people affected by the crisis but to also urge the U.S. Senate to approve $600 million aid to the city. The amendment was created by the Senate Democrats with funds for health care, education, and repairing the lead filled pipes. "Flint should be able to start making the repairs you need to restore safe water as soon as possible," Clinton said. The former Secretary of State assured the full congregation that she will continue to stand with them. "I will be there with you and I will make sure that in anyway that I can that American stays with you too," said Clinton. For many people at the church, having Clinton's commitment to them, brings them hope. "We've been struggling so long in the Flint area and to see somebody like her to come in and actually want to help our city it's just tremendous" said longtime Flint resident, Pat Cavette. Cavette hopes Clinton will keep her commitment to help the city until they are lead free. "As time passes the cameras go away," said Cavette. "The celebrities go away, but she seems like she's gonna be in it for the long haul and we'll see. Time will tell." The former first lady will return to the city to debate her opponent Bernie Sanders on March 6th.